At first glance anyone unfamiliar with Domino won’t know what you are trying to show, you’ve omitted that you are taking advantage of the mechanic where her s1 increasingly gains more attack the longer she does not use it. Without that preface it’s really difficult to understand the issue. Chances are if there is an issue they will just adjust the wording. Sadly Domino has taken a hit due to her original abilities on paper were extemely OP. Noticing this more an more with champions abilities not working as read, though proabnly working as intended. I have a feeling Symbiote Supreme is going to fall victim of this as well. any update on this...? seems to definitely not fit the description. Why is only the first part having the increased attack? In the vid by OP, it shows WS being unlucky for both hits of the L1. Each hit has a 25% chance to inflict Bleed, dealing 1381 damage over 7 seconds. 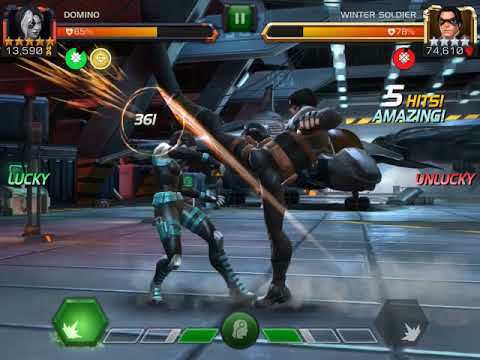 If Domino is Lucky, this attack refreshes all Stun and Bleed effects on the opponent. I think I know what the problem is. The problem is that the first hit gets the attack boost, but then it resets attack because the first hit of the special constitutes as a special attack. This is ridiculous that this issue hasn't been addressed yet. I've been experiencing the same issues that all of the previous summoner's on this matter has been having!..although I don't use her much in quest yet!..it does happen from time to time and yes Domino's critical bleed is broken. She's still one of the most amazing champs on my roster as a 3* and in this game. Mike didn’t realize any different he said in another thread. We are all wrong. He will close the discussion soon. The Kabam way of life. Months ago they wrote „we are not planning any changes at Domino“. So someone said to the trainee „hey trainee, please make a pizza in the microwave. Press buttons xoo173x. The microwave has WiFi and Domino becomes buggy. You will be the trainee of the month“. @Kabam Miike Valida esto y arreglen el problema.